Collaborators Shana McCaw and Brent Budsberg have been exploring the different forms of American architecture built by European immigrants, such as the artists' own families. They have staged costumed performances captured in film and photography, their lonely alter egos wandering in an open landscape or creating unknown concoctions out of the weeds and twigs of their new, unfamiliar landscape. The artists look for the ripple effects of those perilous migrations, their work trace those remnants in our current landscape. 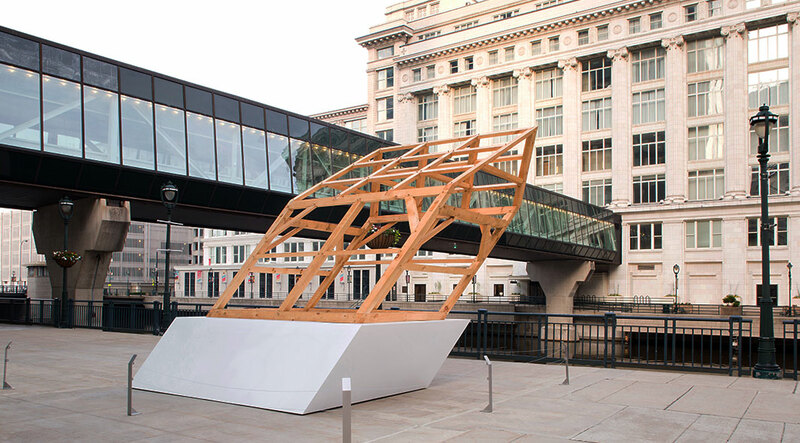 Their newest work, Skew, points to the skirmishes of past and present in our collectively shaped landscape, where even our buildings become stand-ins for the conflict of their makers. Over the past few years, McCaw and Budsberg have noted the improbable shapes adopted by disused barns scattered across the Wisconsin landscape. These barns started with the well-made lines of functional buildings, but slowly, they sink into the natural forms of the land from whence they came. The buildings slump and shift under the weight of time and weather. Skew brings this unique rural geometry into the 21st century. The artists have taken lumber from a white pine from a tree that fell on Budsberg’s family’s property in northern Wisconsin to create their modern-day “barn”. Budsberg, a master craftsperson, together with a small crew of skilled woodworkers, is timber-framing Skew, relying on modern computer tools to calculate the geometries for the shape while using the hand tools of his pioneer ancestors to frame the barn. Skew brings the history and scale of 19th century architecture to the state’s busiest place of growth, and the stark difference between the hand-crafted and the high modern measures how rapidly our region has evolved over the past 100 years. McCaw and Budsberg were trained as artists in Wisconsin, and live and work in Milwaukee. They have presented their installations in Canada and across the United States, including Cleveland, Los Angeles, Milwaukee and Minneapolis. They have held residencies at the Kohler Art Center, Sheboygan, the Goldwell Open Air Museum, Beatty, Nevada, MKE<->LAX, Los Angeles, and the Center for Land Use Interpretation, Los Angeles.